Confused By All Our Apple Trees? Then Look At Our Easy Apple Tree Selection. Only released in 2000, Jumbo (Malus domestica 'Jumbo) is the result of a cross between the apple varieties Red Charles Ross x Tetraploid Jonathan. 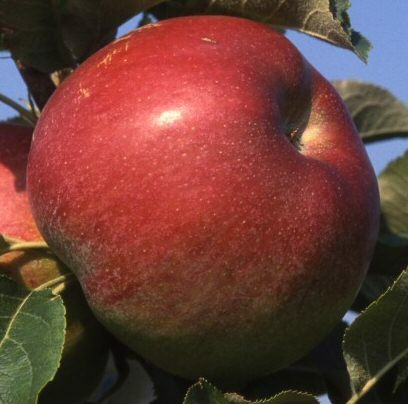 The apples are particularly attractive, being flushed and striped red on a pale green background with a deep red blush and attractive red flecks. Golden cream flesh. The apples are very large and dual purpose, being particularly good for baking as they retain their colour. For eating fresh they have a good acidic, aromatic flavour. Tree vigour is moderately strong. Needs no sugar for cooking. Self-fertile/Not self-fertile: This apple is not self-fertile and requires another apple to act as a pollination partner. This apple is in flowering period is C3 BUT is a TRIPLOID. MAIDEN 1-2 years old, no pruning or shaping. Blank slate for you to shape and train. PATIO Shaped to produce compact bush proportional for pot size, ideal for container growing. (12L), (3L) etc The size of the pot measured in litres.